The first thing you'll probably want to know about an IF authoring system is what sort of games it can produce. 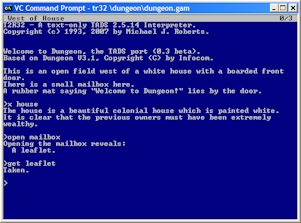 TADS is, of course, optimized for creating Interactive Fiction. The basic conversational, command-line structure of IF was established by the early text adventures, and most IF today still hews closely to that original model. When you start a new TADS project, you start with essentially a working text adventure without any stuff in it. If that's the style of game you're shooting for, all you have to do is add your rooms and items and characters, because that starter framework already has a working command prompt, parser, and so on. But TADS can produce a lot more than conventional IF. 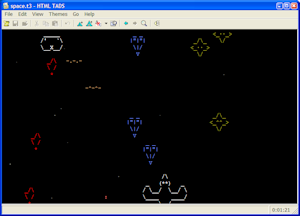 TADS has been used to create Choose Your Own Adventure games, combat-oriented RPGs, video games, and even file-processing utilities. That's not to say that TADS is the ideal tool for writing your next accounting suite or first-person shooter. But that flexibility to do more is vital if your thinking is outside the usual IF box, and it's useful even if you're writing fairly conventional IF and you just want to incorporate a few surprises. If you want to drop into video-game mode or a chat simulation in the middle of an otherwise ordinary IF session, TADS can do that. TADS is designed to make the usual things easy and the unusual things possible. IF is at its heart a textual medium, but text can often be enhanced by illustrations and graphics. TADS offers multimedia interpreters that let you include graphics, animations, music, sound effects, hyperlinks, proportional fonts, and fancy text layout. TADS uses HTML as its layout language. HTML is a great fit for IF, because it has the same text-centric nature as IF. It's a natural evolution of the terminal-style interface into something more modern. 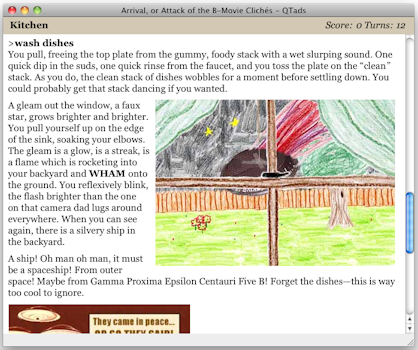 HTML makes it easy to integrate graphics into the flow of the text, for an effect like an illustrated novel. TADS compiles games to a byte-code format that's portable to any platform with a TADS interpreter. It doesn't matter what operating system you use as an author; once compiled, the byte-code file will run on any system with an interpreter. Most desktop operating systems are supported. Full multimedia interpreter are available for Windows, Mac OS X, Linux, and most Unix variants. One of our key goals in developing TADS is that you should be able to make a finished game that's professional and polished. Some of that is up to you, of course - a big part of an IF game's quality is in its writing. But the interpreter is the face of your game, so we try to ensure that it gives players a seamless playing experience. Even though IF isn't a commercial category any more, our quality goal is for finished TADS games to be slick enough that you could publish them commercially.